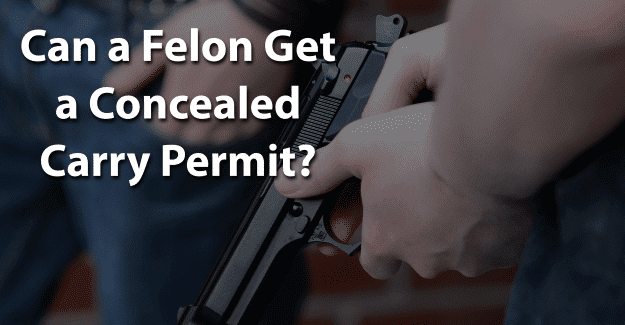 Can a Felon Get a Concealed Carry Permit? There are federal restrictions against felons owning a gun regardless of whether or not their crime involved a firearm. While it’s illegal for felons to possess a firearm, can they get a concealed carry permit? This blog post will address the question of whether or not a felon can get a concealed carry permit. In 1934, the federal government passed a law denying anyone convicted of a violent felony the right to own a gun. This law remained until the Gun Control Act of 1968 when it was amended to include all persons convicted of any felony, even those that did not involve violence. This law remains in effect until this day. Open carry refers to having a gun and transporting it in plain sight. It must contained in a holster and visible by others. Concealed carry is when someone can carry a gun and keep it hidden. Every state allows the carrying of concealed weapons in some form. Forty-two states require a state-issued permit to carry a concealed weapon in public. Anyone who has been convicted of a violent felony in which someone was harmed or killed is disallowed from obtaining a concealed carry permit. In the case of a nonviolent felony there may be a waiting period of 10 years from the date of the conviction. It’s important to contact a lawyer in the state of residence for legal advice. The process for restoring gun rights depends on whether the felony conviction was from the state or the federal government. It’s an easier process if the felony conviction was from a state court. So, what state their felony conviction is from can make a difference. When state and federal laws conflict, the stricter one will apply. If the conviction came from the federal court, there is an application procedure to follow. This application is filed with the U.S. Attorney’s office or with the Bureau of Alcohol, Tobacco, and Firearms. There are of course conditions which must be met to gain approval to own a firearm again. First, the applicant must not have been convicted of a “forcible” felony within the last 20 years. Also, at least 20 years must have elapsed since the end of any incarceration for that felony. Next, the applicant’s criminal history and reputation must be such that the applicant will not act in a manner considered dangerous to public safety. Additionally, restoring a felon’s firearm rights must not be considered contrary to the public interest or federal law. For those felons with nonviolent felonies, or those considered to be minor, the process is not as difficult, provided felons have lived crime-free lives during the last 20 years. In order to establish having lived a clean life for the previous 20 years, felons must demonstrate a stable work history and strong, healthy ties to their community. Employment is probably the most challenging aspect of returning to society. Many felons struggle with finding a job because the stigma of having a felony deters employers from hiring felons. Having healthy ties to the community involves having good relationships with their families and friends as well as being involved in community and volunteer work. Maintaining and documenting that involvement will be valuable to felons wanting to regain firearm rights as well as any other rights. Volunteer work and other contributions to society will aid their case. Changing friends and hangouts is also important. Once this is accomplished, not only can a felon own a firearm but he or she can obtain a concealed carry permit for that gun, depending on the state. Having their record expunged can give them the chance needed to begin with a clean record and succeed in getting a concealed carry permit. Expunging a criminal record allows anyone to honestly state on an application that he or she has not been convicted of a crime. If a felony isn’t disclosed but is found on a background check this constitutes fraud and is punishable by jail time. It is a crime to falsify an application, which could result in being sent back to prison. It’s a major challenge, but it might be worth it for a felon wanting to get a concealed carry permit. To give him or herself the best chance for success by having his or her record expunged and also documenting additional education could make the essential difference. What do you think about this blog post? Have you or someone you know been in the situation of trying to get a concealed carry permit with a felony? What was that like for him or her, and how did he or she achieve success? Please tell us in the comments below. Twenty years may be the case in some states, but I know in my state (WA) a person can apply to have him rights restored after 5 years of living crime-free. Also I recently heard it doesn’t have to be the 5 yrs immediately before the petition. If a person lives 5+ yrs crime-free then commits a misdemeanor that wouldn’t otherwise cause them to lose their gun rights they have still fulfilled the 5 year obligation and can apply to have their rights restored.